October 15, 1858 found the City of Alton the site of the seventh and final debate between Abraham Lincoln and Stephen Douglas. The debate was a prelude for the 1858 Congressional elections, in which both men were candidates. Over 6,000 people gathered for the event which was in front of the City Hall. State and national figures were present as well as press representatives from Boston, St. Louis, New York and Chicago. The debate carried on for three and one half hours. In 1908, a committee was formed in Alton to sponsor a parade and festival in honor of the event. A commerative bronze plaque was presented and mounted at Alton City Hall. The area then became known as Lincoln Douglas Square. When the building burned in 1924 the plaque was mounted on a granite boulder. Today Lincoln Douglas Square has been transformed into a monument to this historic event. 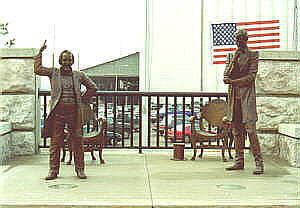 Full size bronze replicas of Abraham Lincoln and Stephen Douglas, convey the intensity and compassion both men felt for their values and ideals. Funds for the memorial project were raised by the selling of engraved bricks. Hundreds of bricks were used to create a walkway around the platform on which the statues stand. Each brick is engraved with the name of the donor or sponsoring organization.